The Picnic Spots in Kerala That Are Yet To Be Explored! Known as “God’s own Country”, Kerala delivers some of the amazing spots and picturesque scenes to behold. The place is no less than Heaven and is an abode to innumerable lakes and coconut trees. People who love to travel should visit Kerala at least once in their lifetime. There are many places in there that are hidden, mostly because of the fact that people have not explored them yet. They are so beautiful and serene that you will love to go back there over and over again. Do you know that besides having the enormous lakes and the greenery, there are certain picnic spots as well that people may not know? You may book online Kerala tour packages to check out the recommended ones. So that you can choose one at your convenience and experience the fun of a picnic with your friends or family along with a nice trip together, at the same time. If you have no clue about it, this is your guide to the same. Check out these places and get ready to bring back memories to cherish for a lifetime. • Anayirankal, Munnar Tea gardens are so alluring and provide you with lovely scenery around to behold. Nestled in the middle of a tea garden, this place makes one of the loveliest picnic spots in Kerala while being on a trip. People from all over the world flock down in numbers to experience the scenic beauty with good food. This place does not make it to the list of the most visited places since it is a hidden gem that is yet to be explored. It is surrounded by the Tata Tea Plantations and thick foliage of the famous evergreen forests. Munnar is a renowned hill station in Kerala and Anayirankal is located 22 km away from the hills. To experience it to the fullest, you can surely go for a boat ride after lunch on the reservoir to cherish the memories, for a lifetime. • Akkulam Tourist Village, Thiruvananthapuram Cradled on the banks of Akkulam Lake, the tourist village of Akkulam provides some of the mind-blowing picnic spots in south Kerala. The atmosphere of the locality is the greatest attraction of all. The backwaters are so lovely and full of serenity that you will not want to come back from that very place. Thiruvananthapuram is about 10 km away from this place. It has some fantastic boating options, and other recreations include a well-equipped park for the children, adults’ swimming pool along with a padded pool. This place is included in the Kerala Tourism websites as well. The largest earthen dam in India and the second largest in Asia, this place have some aweinspiring scenic beauty with all the aesthetic feels. With a gush of cool breeze at sudden intervals and tranquility prevailing in the serene atmosphere, this place will give you some major travel goals. The gigantic slopes, the sparkling waters of the dam and a wildlife sanctuary makes you feel like you are residing in the very warm and cozy lap of Mother Nature. It has got some boating options as well to explore a bit more of the pristine beauty. This is the best of Kerala Tour Packages that include food and accommodation. â&#x20AC;˘ Alapra In Kottayam Situated in Kottayam district Alapra is one of the most amazing villages of all times. It is the only place where the ritual of padayani (a traditional folk dance) is performed. The place is dotted by spectacular views, daunting waterfalls and legendary caves that are aesthetically more appealing. â&#x20AC;˘ Bolgatty Island, Kochi Set near Fort Kochi, Bolgatty Island is a lovely little island in the Ernakulam district of Kochi. The place is notable because of the presence of the Palace, which was built by the Dutch and then eventually conquered by the British. After the palace has been transformed into the resort, The KTDC or the Kerala Tourism Department Corporation Hotel and Resorts now stand there. The resort has come up with its own golf course and honeymoon cottages. 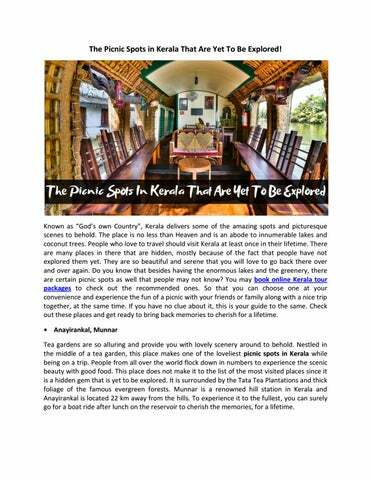 You can find more about it on the Kerala Travel Guide. A tour to Kerala, away from the agonies of life can be as rejuvenating as a cold shower after a long day at work. Especially if you are planning to look out for picnic spots, these places can provide you with the best of food and Nature under one sky. Enjoying your food and having fun while getting a tour of the magnificent backwaters and the dams, this trip shall be etched in your heart for life!